Is it just me, or is Ken Ham sounding a little... desperate these days? I suppose it's understandable. Just last year his discriminatory hiring practices lost him $18 million in tax write-offs for his Ark Encounter project, and that's gotta sting. He's challenged the decision in court, but seems unlikely to win given that he has made a practice of only employing fundamentalist Christians like himself, and the project's website states right up front, "The purpose of the Ark Encounter is to point people to the only means of salvation from sin, the Lord Jesus Christ, who also is the only God-appointed way to escape eternal destruction." So not much wiggle-room there. 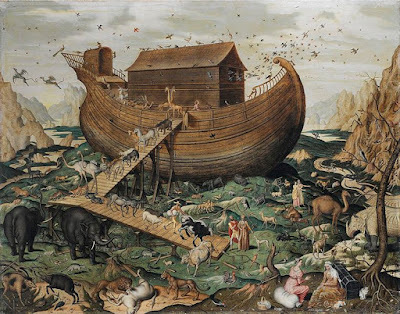 And with the funds drying up, Ham has to start being a little creative with revenue-producing strategies, or the Ark is likely to founder on the rocks and sink. From this vantage point, Ark visitors will be able to watch the crews assemble the support towers this month, and over the next few months see the placement of lumber and timbers in sections called bents (or “ribs”) on the Ark foundation. Who could resist that? $20 a person to see a construction site! People must be elbowing each other out of the way to be the first for a vacation opportunity like that. Can't you just hear the conversation in the car? "Daddy, when are we gonna get there?" "Soon, son. Pretty excited, aren't you?" "Yeah! I can't wait to see the concrete posts! And the steel I-beams! And piles of dirt! This is gonna be the best vacation ever! I'm so glad we cancelled our plans to go to Disneyland!" So, yeah. Thrill-a-minute. I bet they'll make nearly $20 off of this promotion. "Hey! I'll let you see the pile of lumber that we're building the Ark from if you'll give me twenty shekels! Another ten and you can come visit the kangaroos we just brought back from Australia! For only fifty, you can be a Gold Star Donor and have your name inscribed on one of the timbers! For a hundred, I'll... hey, wait, where are you all going? Get back here! I mean it!... I hope you like drowning! Bastards!" So that's the latest from the Forty Days And Forty Nights crowd. The sad part is that there are a good many people with more money than sense who are backing the project, so I'm guessing that Ham will eventually build the thing and pronounce it a triumph for the biblical literalist viewpoint. He certainly seems determined to keep going -- come hell or high water. What's making the construction so expensive is all those damn Democrat worker safety and union rules. If you have to pay your workers and let them take breaks, naturally the project takes forever and costs a fortune. "Get back here! I mean it!... I hope you like drowning! Bastards!" ...had me in stitches. Tip of the hat to you, sir.